The pad Thai at Alex Thai Food was the only dish served communally. That quote may be attributed to Dutch scientist and agriculture advocate Louise Fresco, but it's a sentiment I also heard expressed on my Eat Sip Walk food tour of Chattanooga's Southside. "We all eat, but we rarely eat the same food. I'm really interested in the concept of connecting people around food. It kind of breaks down these walls immediately when you share the same food," tour owner Ryn Tompkins said as we were wrapping up at our second stop. I hadn't come for food beyond what would fill my belly, but I took a minute to think about food's duality as both a cultural marker and universal human need, and about the many ways in which it nourishes us. Eat Sip Walk owner Ryn Tompkins says the management or owner at each restaurant visited tries to make time to talk to the group. La Altena was the only one who did so on my tour. Food is part of our identity. Our first of five stops on the three-hour tour was La Altena, a favorite of mine and my sister Melissa's when all that separated us from cheese dip and margaritas were the few blocks from our duplex on Mitchell Avenue. 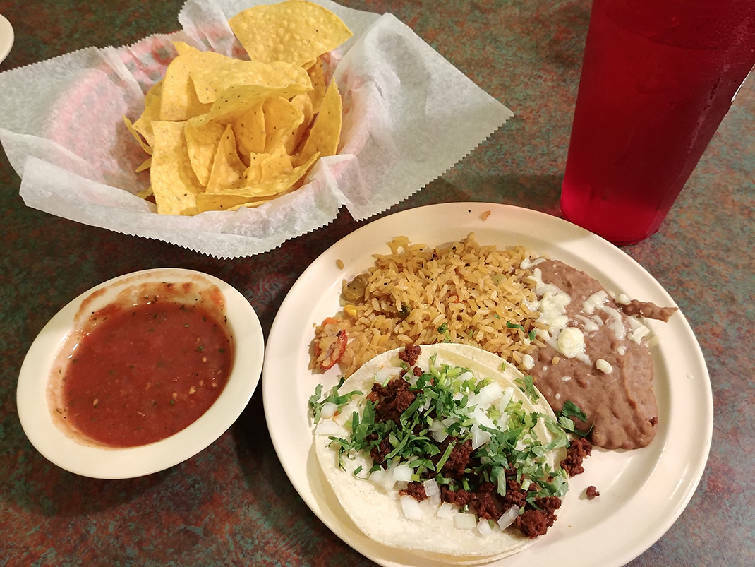 As I tried not to inhale my corn-tortilla chorizo taco, even distracting myself with refried beans, which I never touch, the owner introduced herself and the main ingredient in her family restaurant's recipes: love. "They say that if you cook with love, people will receive that," she told our tour of 12. In fact, I could taste it in the beans, which I've generally sworn off for being too basic. But these were different. I could tell a lot had gone into them, evidenced by their silky texture and flavorful profile, the result of an eight-plus-hour cook time and an ingredient I can't pronounce. All the recipes, I learned, were family ones. The restaurant itself was born of the love of a mother. "We started selling food because people asked for my mom's recipes," she said. "She had nine kids and she cooked for us, and people smelled the food and asked for the food." The only constant at The FEED Co. tour stop is the sangria. Tour guide Marilyn Goler says coming to FEED is always fun since they change what they serve the tour each time. The day of our tour was overcast, threatening rain. 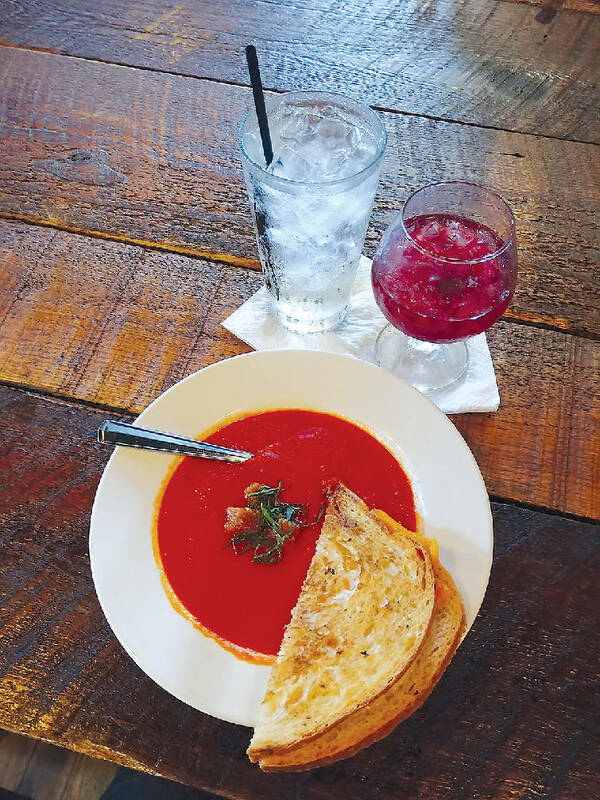 Our second stop, The FEED Co., served the perfect antidote: homemade tomato soup and grilled four-cheese sandwiches, with a side of slightly spicy sangria. While not the most innovative offering on the tour, the meal — nearly each stop offered enough food to be considered such — filled me in more ways than one. Melissa and I were again seated with a middle-aged couple who'd come up from Atlanta to celebrate their birthdays, and we began to delve deeper into getting to know our tablemates. Prior to this trip, Chattanooga had never been more than a quick stopover to stretch their legs, breaking up their drive to points beyond. In each new city, they take a food tour whenever possible, since food is a large part of culture. This made about a dozen for them. Conversely, this was probably about my 12th time visiting FEED. Having lived in the Southside, the majority of the stops on the tour were old stomping grounds, yet I wasn't served anything I'd had before. Take the tour again and that would still likely hold true, as the menus change. Tompkins says about half of the tour's business is locals. Food offers us the chance to experiment. I'm surprised by how many people haven't tried Thai food, especially considering it incorporates the same basic ingredients as Chinese food, yet with more flavor agents. It's one of my favorite cooking styles, and Thai Smile is one of my favorite restaurants. 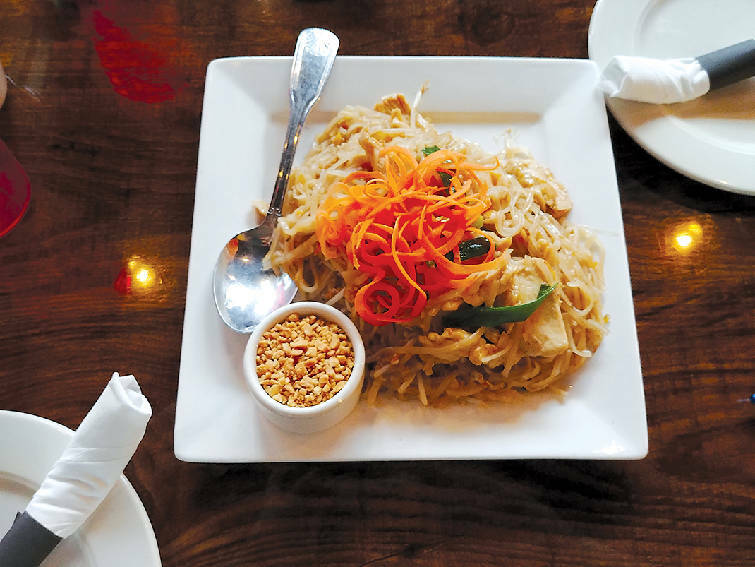 Our third stop, Alex Thai Food, is an offshoot owned by the same family. It boasts the same three-page book of a menu that takes me almost as long to peruse as it does to eat my meal. Luckily, the hard part had been handled for me and several large plates of pad Thai had been ordered for all, though they served the peanuts and spicy oil on the side so we could each build our plate to our liking. Again, this was not something I'd ever thought to order, opting instead for more involved dishes, but I found that even a dish as ubiquitous as pad Thai can have its own personality. This iteration was sweeter than most, a fact which our tour guide, Marilyn Goler, had prepped us for as the plates were being delivered. It was clear she was intentional when it comes to food, paying attention to how flavors play with each other and how people react. In fact, she'd been introduced to the Scenic City decades ago, while working in research and development for Krystal. She helped bring the Krystal Sunriser to life, and had since decided she wanted to live her life in the Scenic City. So following 25 years as a restaurant consultant, she made the move from Chicago and got involved in another side of the food industry — one that is still relatively new to Chattanooga. Though the tour company is over a year and a half old, the concept is one Tompkins says she's still working to educate local restaurants about. "The hardest part about this business is pitching it to restaurants," says Tompkins, who is working to recruit more so that she can add North Shore and St. Elmo tours. "They don't understand what a food tour is." 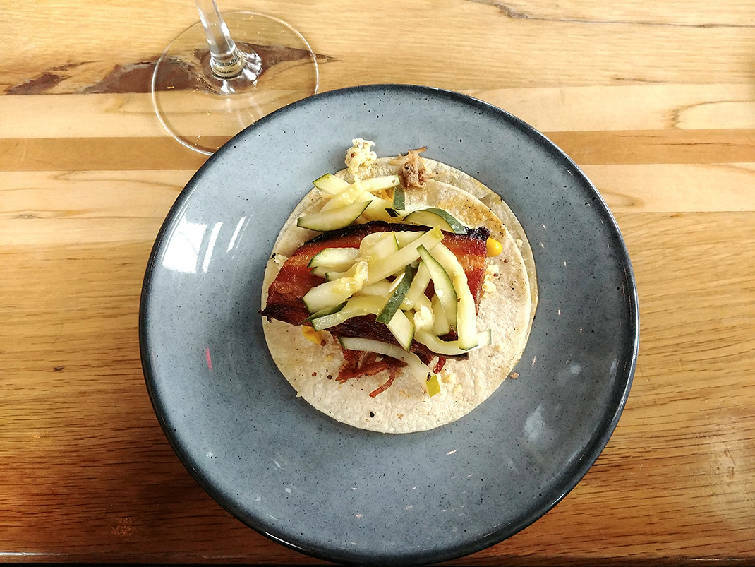 While I love the Flying Squirrel, I must admit the pork taco we were served was not my favorite dish. The tour offers the option of ordering outside of what's provided, though only about 30 minutes is spent at each stop. Melissa and Jennifer Bardoner sharing the pleasures of the Eat Sip Walk food tour. One of my favorite places to grab a drink in Chattanooga is Flying Squirrel. From the sweeping architecture to the friendly bartenders to the inventive food accompaniments, it is the real deal. Stop by any evening and you'll see it must be the same for many others; there are almost always groups crowded into the open space and spilling onto the patio. Our food tour, however, stopped by just after the restaurant had opened, so we virtually had the place to ourselves. We spent our allotted 30 or so minutes here nibbling our pork tacos, sipping Champagne cocktails and playing a variation of two truths and a lie, trying to guess which of three statements was accurate about our tablemates: the same Atlanta couple and both Tompkins and Goler. Food does that. As Tompkins had said, it unites us in a shared experience, opening the door for intimacy. Why do you think so many dates happen at restaurants? Despite having lived just a few blocks from Conga Latin Food, this was my first time in &mdash; but won't be my last. "I'm really a restaurant advocate," says Eat Sip Walk owner Ryn Tompkins. "I like expanding restaurants' customer bases." I try to find joy in the small things, and while I don't consider food a small thing, it is one of those ordinary pieces of our everyday. 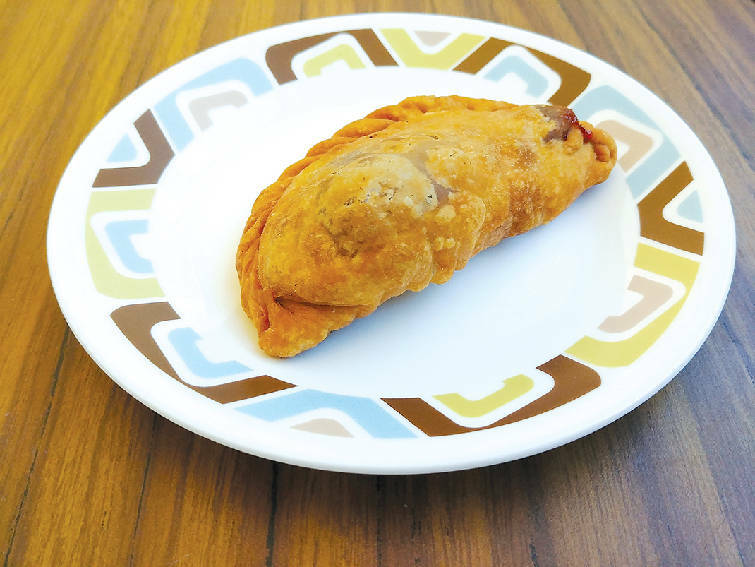 As I wolfed down the surprisingly well-paired guava-and-provolone empanada at our last stop, Conga Latin Food, I thought about how two such simple and seemingly opposite ingredients could elevate each other, resulting in a shared complexity. At the next table, the rest of our tour group celebrated something similar. Eight young college grads from across Tennessee had reunited as a bachelorette party. Tompkins had sat them separately from the Atlanta couple and my sister and me at each restaurant so that we could all get in some quality time — another mindful touch I noticed. She'd also shared historical trivia and tidbits about local businesses we passed on our 12-block trip down Main Street, and recommended other dishes and restaurants to try. As we sipped the last of our sangria, she excused herself to deliver a personal gift she'd picked up for the bride, reinforcing that some of the sweetest moments happen around the table. Each tour costs roughly $60 and lasts three hours. For now, the same five restaurants on Chattanooga's Southside are featured, though that could change. In addition to a North Shore and St. Elmo tour, owner Ryn Tompkins also hopes to develop a virtual downtown tour, offering the opportunity to go at your own pace, or just opt for the cultural portion as opposed to a full food tour. Visit eatsipwalk.comto learn more.